Biography. Citations, CV and selected exhibitions. 1976 Formation de sa companie 'Simon Fletcher Landscapes' à Oxford. Directeur de l'Oxford Printmakers Cooperative. 1983 Diplome d'Honneur, Salon d'Agde, France. 1983 1re prix pour l'aquarelle, Mouvement Artistique Française. 1997 Publication de son livre 'Das Pastel'. 2000 Medaille d'or, Salon International de Beziers. 2016 Musee d'art Modern, Salerno Italie, avec catalogue. l'aquarelle en plusieurs établissements Allemands. Il a publié douze livres en trois langues. 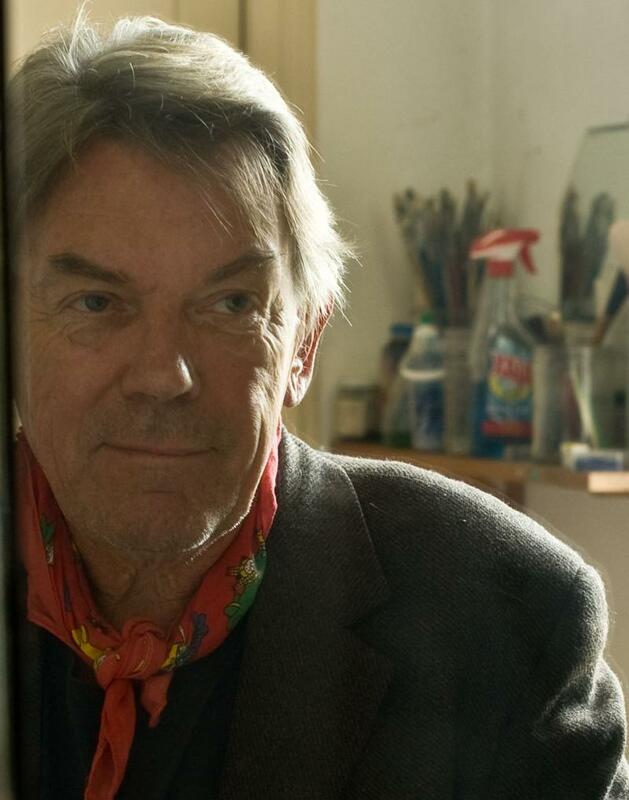 Simon Fletcher “I never cease observing landscape and finding the ineffable logic therein,” says Simon Fletcher, the artist who has made the South of France the principal subject of his watercolours for the last thirty years. The stripes and cubes, whorls and dashes in his pictures, provide a uniquely satisfying and unorthodox structure to his works. Their colour - luminous, transparent sweeps of teal and aquamarine; violet, lavender and ochre - appears to have emanated directly from the Mediterranean landscape. This is the terrain that inspired Cezanne and Matisse. Like them, the flourishes of natural design in the frond of a fern or the spears of a cactus are relished by Fletcher whose paintings reflect the relentless order of Nature as well as its anomalies. Fletcher’s latest works are drawn not only from the South of France but also from Morocco where the dry woodland and succulent cacti contrast with the limpid, turquoise sea, beyond. There are also views of the Orb Valley in the South of France with its hanging gardens at Roquebrun, a village beloved by the Romans. St Martin de l'Arcon in the Orb valley overlooking the confluence of the Jaur and Orb rivers is another subject and the picture of the blue tree was done at Cessenon in a very ancient winery, probably dating back to pre Roman times where the 'flow' of the landscape use can still be seen. “I'm a classicist and love the way the Romans were so site specific about their building,” says Fletcher. “Pliny for instance gives a discourse on how villas should be sited on a gentle South Eastern facing slope with overhanging eaves to protect from the summer sun.” It is the combination of classical precision and order and modern vibrancy and vigour that makes Fletcher’s paintings so timeless and enduringly pleasurable to look at. Catherine Milner was, for more than ten years, the Arts Correspondent for the Sunday Telegraph and has written about contemporary art for a number of newspapers and magazines including the Financial Times, The Economist, Apollo Magazine and Art Review. I first met Simon Fletcher about ten years ago in the south of France. The event was the launch party of my book Notes from the Languedoc, but just ten minutes of talking convinced me that he knew the region better than I ever would. Even so he was very generous in his praise of my efforts, something that was particularly striking, as artists are generally curmudgeonly souls, as inclined to praise as a football manager is to say a good word about the opposition. Ask any artist what they think of Pablo Picasso and they will reply: “A fair draughtsman”. Or Matisse: “A tolerable colourist”. But Simon was kind, praising my enthusiasm and failing to point out my many errors. This, I think, is the mark of a true artist, as well as a gentleman, somebody who can tolerate another’s work without thinking it diminishes his own. In order to tap into his knowledge and make myself look good, I persuaded him that we should do a book together. We discussed various options over the odd glass of wine and discovered that we shared a number of passions: the wine, the landscape and the architecture and people of the Languedoc. He had lived in the Haut-Languedoc for nearly 30 years: he knew its ways and moods intimately. Two years later and the planning was done. We spent a number of memorable days in 2004 visiting 20 different wine domaines in the region. I would write about it; Simon would paint it. He didn’t just paint it beautifully, but he helped me see it clearly. I have always been drawn to writers who can make you see. Give me Robert Byron or Bruce Chatwin any day over James Joyce or José Luis Borges. One day we were at a monastery in Mougères, just outside Pézénas, about half an hour from the Mediterranean. I wandered off to look at the buildings and the vines, and left him alone with his easel. When I returned he showed me the work. Did I like it? He asked. I couldn’t help thinking he had overdone the colours. His response was to pick up a simple blade of grass. Look closely, he said. There they were, pink and red and burgundy, just as he had painted. I hadn’t noticed, because I hadn’t been looking properly. I particularly like the comparison of a watercolourist to a fighter-pilot. The subtle art has been rather denigrated in England by the term ‘watercolour drawing’; it also probably hasn’t helped that Prince Charles is said to dabble in it and has even exhibited at the Royal Academy’s Summer Exhibition. I don’t mean to denigrate the amateur, but Simon’s art is more serious than that, and his technique second to none. Simon remains wonderfully young at heart, keen to enjoy a swim in a river, a glass of wine or to play the guitar at a picnic, an event that may start at noon but stretch late into the night. As Shakespeare’s Falstaff said: “We have heard the chimes at midnight”. We were with him this summer in France and he asked me to carry his paintings over in preparation for this exhibition. I did so, and also had them framed. Rather than leaving them sitting in a darkened room, I hanged them on the walls of our villa. For two glorious months our house was full of the colour and talent of this inspiring artist. It is a duller place now that his paintings are no longer hanging there, but somehow their spirit survives, vibrant and determined, youthful and energetic, rather like the artist himself. Rupert Wright is the chairman of Edelman Middle East and author of Notes from the Languedoc, Wine and Landscape of the Languedoc and Take Me to the Source: In Search of Water. Sir John Tusa July 2001.
varying lights, surrounded by a wildly diverse assortment of companions? Here too the verdict is affirmative. is quite unlike the conventional English water colour. reinforced a confidence in his reaction to strong colours. it personal and real? Without a doubt. SIMON FLETCHER, BA. BIOGRAPHY. Born Birmingham, England. 1997 Deutsche Telecom, sponsored exhibition, Munich. 2000 Commune of Ravello, Italy, works on paper, one man show. 2000 Hitachi International, sponsored exhibition & book ‘ The Way of the Moving Brush’. 2001 Musee d’Art Contemporain, Beziers, retrospective exhibition. 2003 Museum Service of Siena, Italy, paintings of Italy, with catalogue. 2003 British Embassy, Oman, recent works. 2004 The Economist, Frankfurt, exhibition of recent work. 2006 James Rothschild, St James Place, sponsored exhibition. Simon Fletcher's work is to be found in numerous private collections in Europe and America and in the following public collections: Oxford University. Bibliotheque Nationale, Paris. Warburg Merchant Bank, London. Foundation Pro Castellione, Suisse. März, Germany. Hitachi Corporation, Germany. Kunst & Kultur, Aschau, Munich. Siemens Germany. The Economist Frankfurt. H R H The Sultan of Oman. Collection of H R H Zayed Al Nahyan, Abu Dhabi. Simon Fletcher is currently working on a series of large decorative panels for a retirement home in France . He has exhibited in galleries and museums all over the world and is a committed European. His work can be viewed at his Atelier Gallery, F-34610, St Gervais, France. By appointment +33 623921960. 1983 - 2000 Various German Art Fairs with Gallery Richard Hartmann, Munich and Galerie N Blaeser, Dusseldorf. 2016 Salerno, Italy. Museum of Modern Art.Simon Fletcher, Spirtual Landscapes Retrospective Exhibition of paintings from the Ravello Archive of Contemporary Art. Catalogue 102 pages, 69 illustrations in colour, full biography and foreword by Masimo Bignardi, Universities of Salerno and Urbino. Texts by Pasquale Ruocco and Luca Mansueto. ISBN 978-88-7554-103-3. A full list of exhibitions, articles and publications is available on request. Simon Fletcher regularly holds seminars in drawing, pastel and watercolour. The painter's works are published as reproductions and cards by Bridgeman, London.